The stories of how millions of women from allied nations joined the industrial labor force during World War II are well-documented, but the breadth of their help goes far beyond filling factory jobs. Industries across the board faced depleted manpower, including forestry, which was undoubtedly important during wartime. To mind the gap, England’s Ministry of Supply (Home Grown Timber Department) founded the Women’s Timber Corps in 1942, and for a few years that followed, so-called “Lumberjills” took to the woods and to sawmills to keep up with increased timber demands. The Women’s Timber Service had actually been set up during WWI, but this new group was a unit of the Women's Land Army along with The Land Girls, the better-known wartime civilian organization of female agricultural workers. 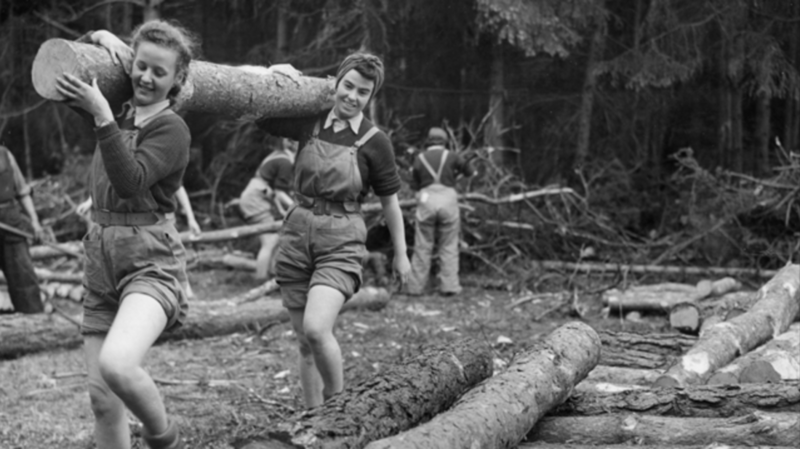 Scotland formed its own Women’s Timber Corps just a month after England's. Scottish women were recruited from age 17, though some ended up joining at ages as young as 14. The work of felling, operating sawmills, crosscutting, measuring logs, loading timber, and driving tractors was difficult labor, especially for young women with no experience at all in the field. The Women’s Timber Corps managed to keep the industry aloft with its roughly 5000 members (some estimates say it was closer to 8000) and ensured valuable timber supplies throughout the war. The unit was disbanded in August 1946, and each member was given her uniform back along with a letter from Queen Elizabeth, the patron of the organization. Despite that personal recognition upon completion of their service, the members of the Women’s Timber Corps didn't receive much attention from the public after the war was over. It wasn’t until 2007 when a life size bronze sculpture was erected in Queen Elizabeth Forest Park in Scotland that the women of the WTC received a proper and lasting memorial. The statue was commissioned by the Forestry Commission and designed by artist Malcolm Robertson.